Painted furniture seems to be all the rave lately, right? Chalk paint, Milk paint, latex paint, so many different types of paint. 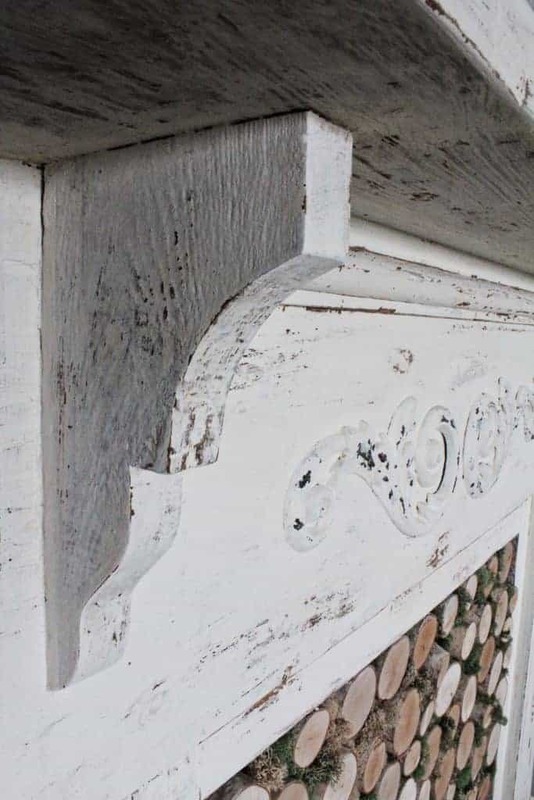 BUT, how do you create that antiqued Chippy paint look? What paint should you use? How do you apply it? I’m going to try to answer all these questions and show you how I painted my fireplace mantel with the easiest chippy paint technique I could find. I’m going to be honest… researching a chippy paint technique was a little overwhelming. Why do people use vaseline? Do I need to buy something called crackle paint? 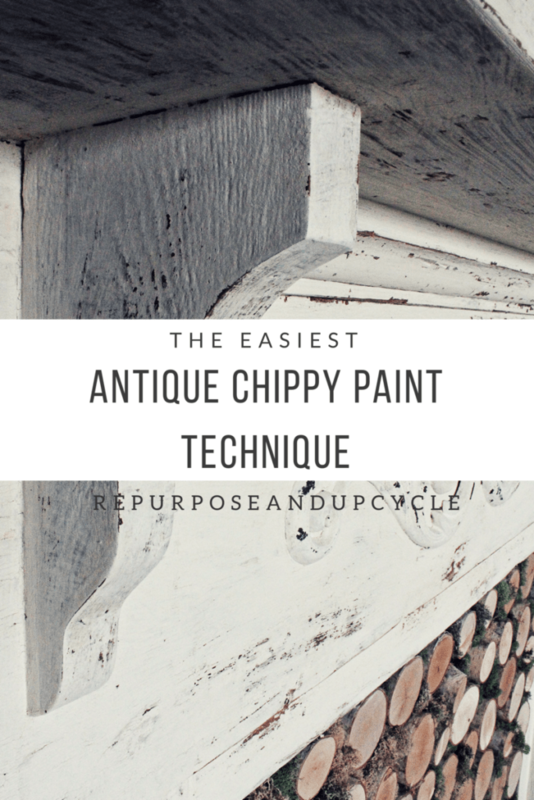 Many more strange questions came to mind as I continued to read blogs and tutorials on creating an antique, chippy distressed look. If you follow me, you know I always search out the easiest method to create with. With that being said, all my research landed me on one common answer; milk paint without the bonding agent. To get the “chippy paint” look, the key is for the paint to barely bond to the surface and crackle as it dries. There are many ways to attain this. Some people use a crackle agent, but this requires painting a base coat, then painting with the crackle agent and then a top coat. Other people use vaseline to prevent the paint from bonding to certain areas, hence creating the chippy effect (i’m still a little unsure about the vaseline technique). The easiest technique I could find was simply using a milk paint without the bonding agent. I recently created an antique faux fireplace mantel and wrote a blog post about it. You can view my blog post HERE. I finished the mantel with a “white wash” finish, but I wasn’t completely happy with it. Hence my desire to refinish it with the Antique Chippy paint look. Below is a quick video showing the painting process from the “white wash” look to the chippy paint look I have now. 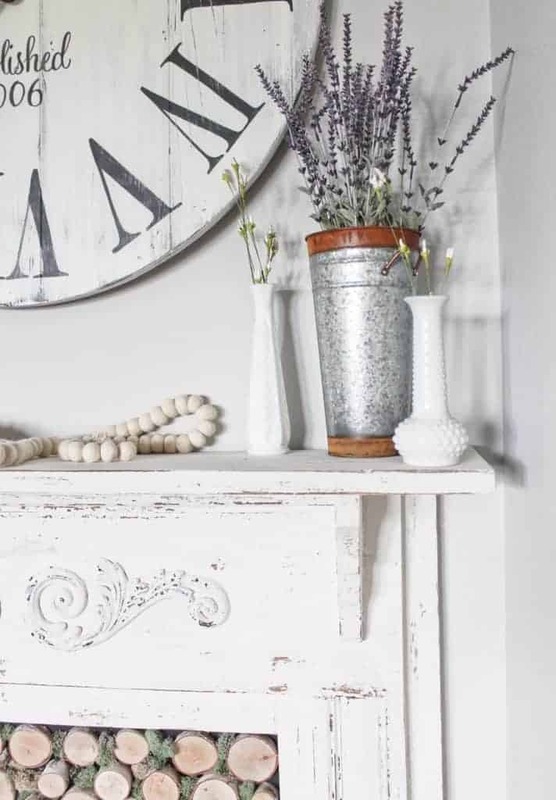 paint the whitewashed fireplace with dark wood tint. I wanted to darken the fireplace so when the white milk paint started to peel away it would look dark and old underneath. Here is an affiliate link to the wood tint I used. 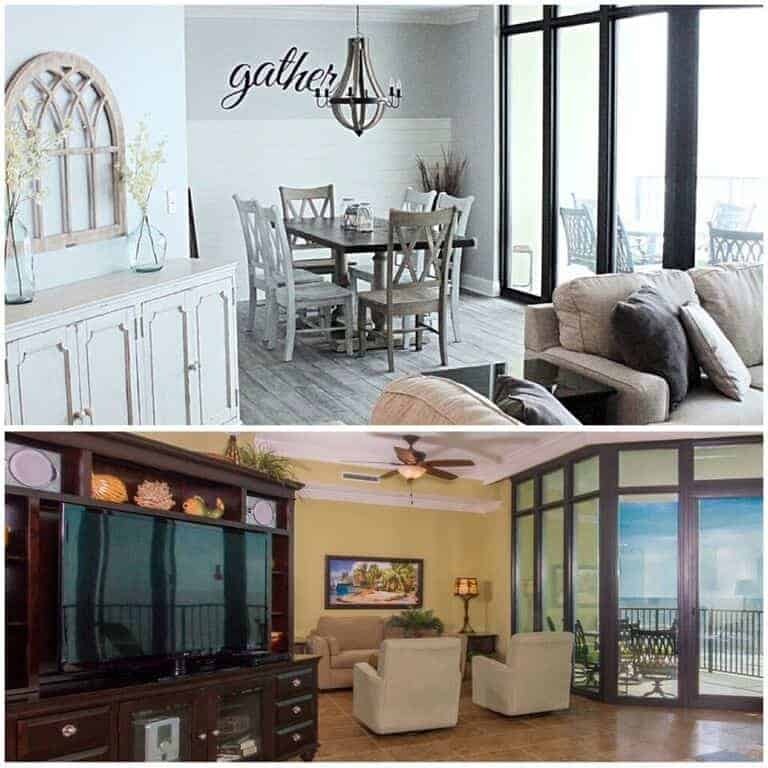 Wood tint can be used to darken anything and unlike most stains, you can paint over it. 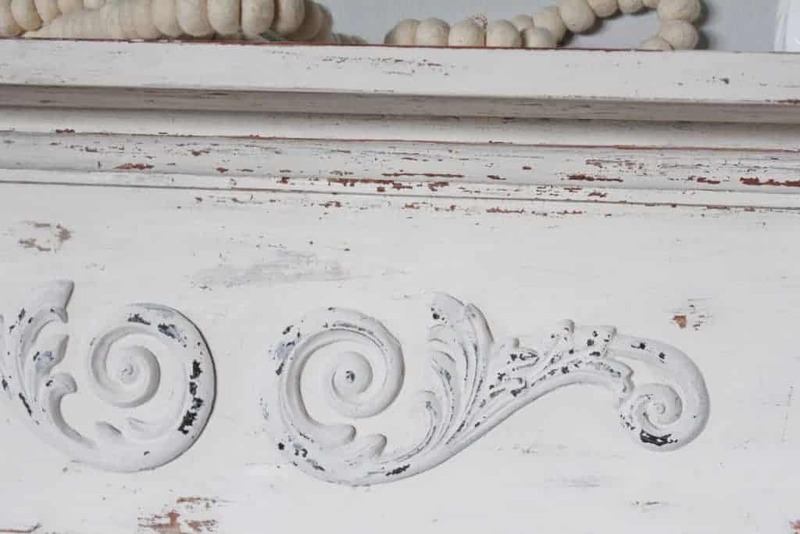 You don’t have to do this step, the milk paint will chip and look just fine without it. paint two coats of milk paint without the bonding agent. The milk paint I used is called Old Barn Milk Paint. I love this paint because it’s an organic compound made from simple ingredients. HERE is a link to their website and to the specific paint I used. Watch the paint chip away! I did distress slightly with a fine grit sand paper. I love all the detail and how the paint has chipped away on its own! It really creates the chippy look of old lead paint without the health hazards. 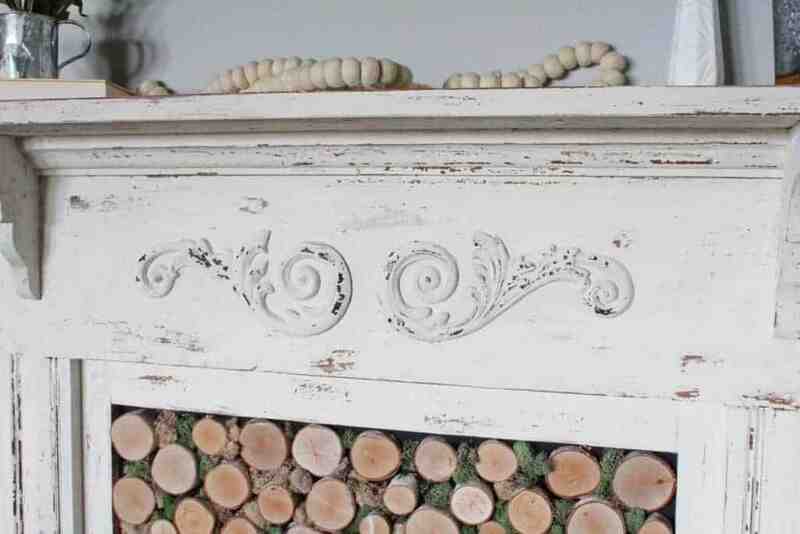 Below are few pictures of my styled antique fireplace mantel. What do you think? I was so pleased to find an easy, one step (really!) technique to create that chippy paint look. 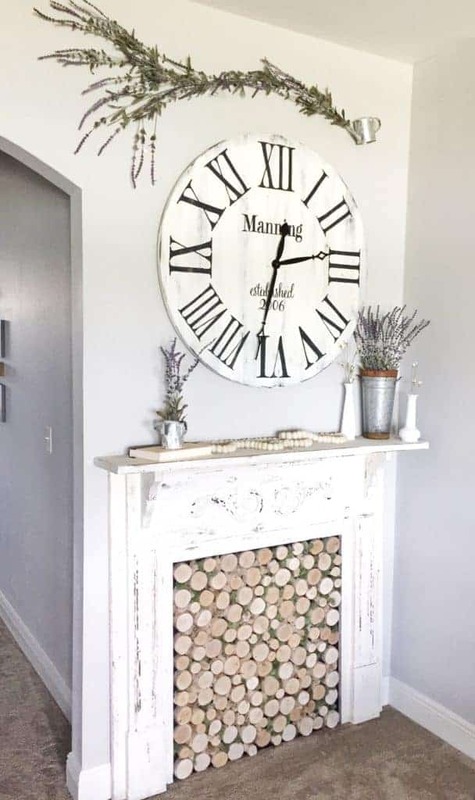 For more information on how I created the faux birch wood insert, refer to my blog post on How to Create an Antique Fireplace Mantel. The outcome on the fireplace came out so lovely. I like the chippy look on some pieces also. I was just talking to my husband about using the chippy method on a set of barn doors we will be installing in our master suite. However, I wasn’t quite sure how to achieve that look until now. Thank you!! Pinning!! Glad you enjoyed my post. Hope your doors turn out great! I just love white interiors with lots of texture. This chippy paint technique fits in perfectly with that look. Thanks for sharing! Thanks for sharing your research, I’m pinning so I can find it again!! The finished fire place is great, visiting from The DIY Link Up. Looks great – Thanks for sharing on the Pleasures of the NW’s DIY party! It is perfectly weathered and distressed! Thank you for sharing with us this week at Celebrate Your Story, and I hope your week is going great. Painting furniture items is so daunting! Thanks for sharing your experience. I’m definitely going to have to give milk paint a try sometime. Thanks so much for sharing at the #happynowlinkup! I also love milk paint, although it doesn’t always chip, especially if the surface is porous. I’m not familiar with wood tint. What’s the brand? I’d like to try it! the only brand of wood tint I’ve used is called Trans Tint. Here is an affiliate link to the product from amazon (where I purchased mine). Wow! Love how your fireplace turned out! Thanks for sharing at the #InspirationSpotlight party @DearCreatives Pinned & sharing. I love this look and it is what I hoped to get with the milk paint I bought, but it didn’t work! What is the bonding agent that you don’t want in the paint? The brand I bought is Home Décor, which you can get at Michael’s or JoAnn’s. 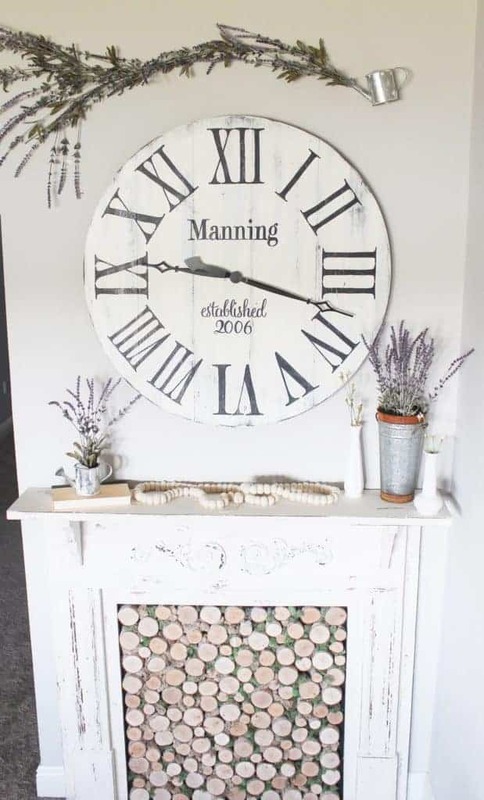 Your fireplace is styled perfectly for the chippy look! Love the wood and moss “fireplace screen”! there are so many different brands and types of milk paint on the market today. Most of the brands you buy at big stores like Michael’s will obviously have the “bonding” agent mixed in. I’m not sure what the bonding agent is called. Old Barn Milk Paint is one of the first companies I had run across where you could buy the bonding agent seperately. I also think Miss Mustard Seed is another milk paint brand you can buy that seperates the bonding agent out. Hope this helps?! Oh Lindsey, I have a faux fireplace that’s portable, I picked up for a steal. Have been trying to unload it as is for a photo staging prop, your making me rethink this. Perhaps I’ll give her a makeover and use it for Christmas prop this year! Loving the milk paint makeover., thanks for sharing it at #FridaysFurnitureFix, hope you’ll pop over on the 22nd for our giveaway! NO don’t get rid of it! Oh how I love a faux fireplace. They can really transform a space. Paint it and give it new life. You did a great job on this fireplace. Scheduled to our Pinterest boards. Thanks for sharing at To Grandma’s House We Go. I too love milk paint Lindsey but have never tried it without the bonding agent. Right now I’m in the honeymoon phase with the regular safe milk paint. 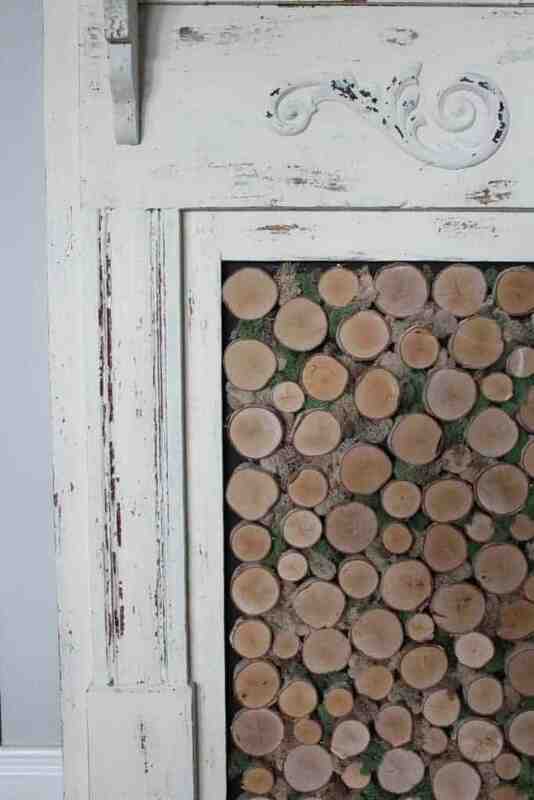 But at some point in the futere I would definitely like to try the original milk paint and get some chippy goodness. Your mantel looks great. Thanks for sharing how you painted your mantel and made your vision a reality. Thank you for sharing at the Snickerdoodle Create~Bake~Make link party! Great job on the chippy paint. Your fireplace looks awesome! The process look easy indeed and worth a try. 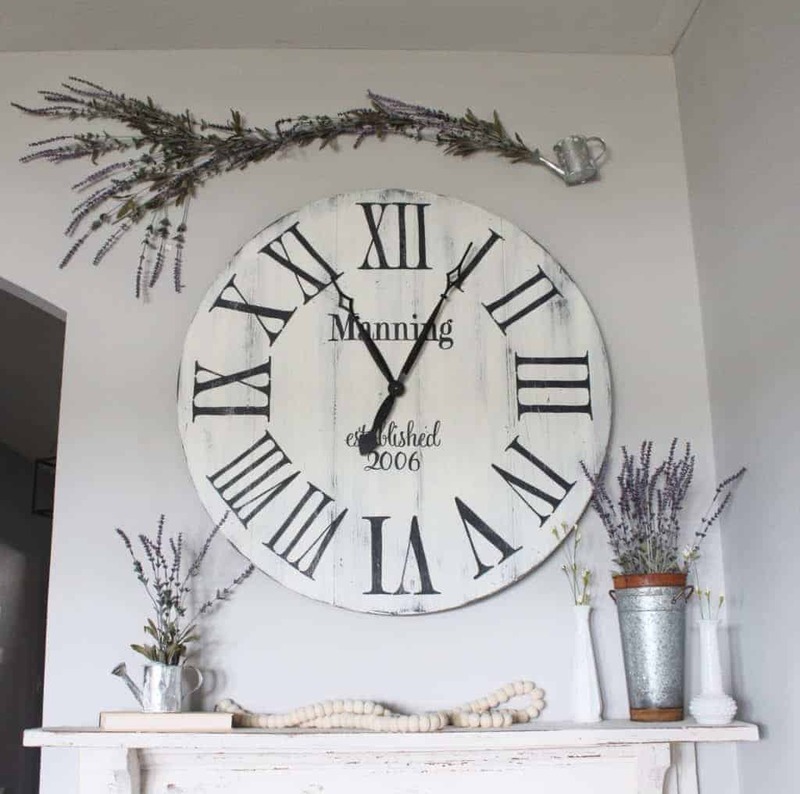 Your wall clock also looks great, what paint technique did you use on it? I did not make the wall clock, believe it or not. It is from a company called Aimee Weaver Designs, but it looks like she did a heavy white wash technique. Hope that helps!